PHUKET: Phuket has closed out the Seven Days of Danger New Year road-safety campaign with two people killed and 46 injured in 46 accidents, the Phuket office of the Department of Disaster Prevention and Mitigation (DDPM-Phuket) reported this morning (Jan 4). Day 7 of the campaign drew to a close at midnight last night, with seven people injured in seven accidents, but no deaths, reported during the 24-hour period. Most accidents involved alcohol and injuries arising from motorbike riders not wearing helmets, the DDPM-Phuket noted. • 15 Using mobile phones while driving. • 133 Using mobile phones while driving. I am sure there will be a lot of mutual back-slapping and self-appreciation but what has this PR Stunt achieved- the sum total of bugger all. The roads are just as dangerous today. I am sorry to say, but I not believe the official figures. 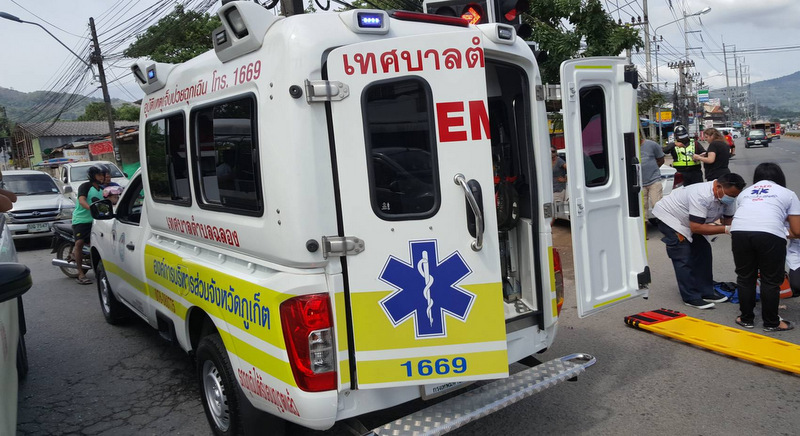 I heard many days around the clock the ambulance sirens on Phuket, and I am sure many others with me. Not a single hour without sirens! How many were not killed on the road, but died in ambulance or in hospital?